Sometimes all it takes is a visual picture to understand what some of these sewing terms and words are. Basting, stitch length, zig-zag, double needle…….do those words sound like crazy talk? Yes? Well, let me explain. And then you won’t get nervous when seeing those words in the future. First of all, a straight stitch and a zig-zag stitch are very common stitches on sewing machines. 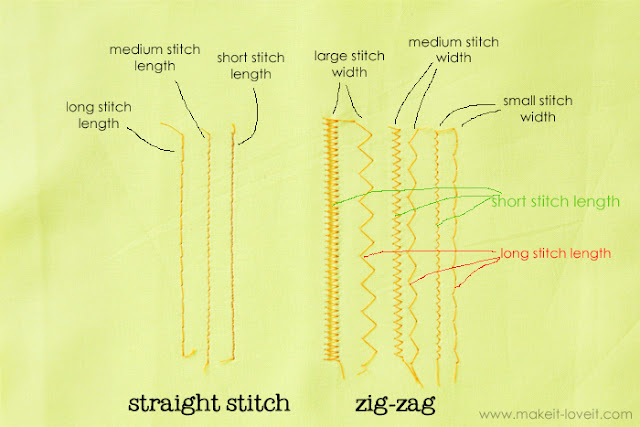 If you have a very basic machine (or sometimes an older ones), you may not have a zig-zag stitch. Or you may have a fancier machine with tons of other options and stitches. Those are exciting too. But these two stitches are controlled by the stitch width and stitch length. You should have some sort of knobs or buttons on your sewing machine to control these 2 functions. If you are using the straight stitch and adjust the stitch length, you will produce different looking stitches. The largest stitch length (shown on the left) is also called a basting stitch and can help you with temporarily holding fabrics in place or to use to gather fabric (gathering tutorial here). If you adjust the stitch width of the zig-zag stitch, you’ll get wider zig-zags…….and if you increase the length, you will increase the distance between each zig-zag. Play around with some scrap fabric and adjust your settings. See what you can come up with. Or maybe you are quilting, making a bag, or sewing some hot pads…..and would like 2 straight stitches next to each other. Well here’s how to do it. Easy, easy. Now, let me explain something. I have had a double needle for a couple of years and rarely pull it out. You need (or so I thought) 2 mini spools of thread to fit on the top of your sewing machine, to thread into the 2 needles…..and I rarely have 2 of the same color……..especially in the color I need. And I always grumble while sewing 2 seams next to each other, wishing I was using my double needle. The other day, someone commented about using a double needle for something and I laughed it off, knowing I didn’t have enough spools in the correct color. And then I realized I could just load up a bobbin and use it as a spool of thread. Oh, that seemed obvious? Oops, it took me a while. Dang. So after 2 years of loving my double needle but rarely being prepared……..my double needle and I are now great friends. I love those 2 straight lines. See how the top post of the needle is just like your regular needle? Take out your single needle and slide in the double needle. Secure it in place. You don’t need a special machine to use the double needle. Then, purchase 2 mini spools of thread or 1 spool and load up a bobbin. Put both spools where you would place your single spool of thread. Now, grab your two thread ends and begin winding them through your machine, as if it were one thread. Then at the end, separate your threads……..
……..and thread each end through a needle. Then begin stitching with your straight stitch, just like normal. You can adjust the stitch length (just like explained above), to help with your different projects. You can also backstitch, just like normal. When done, you have a perfectly straight set of lines. And from the back……it creates sort of a zig-zag. And because of that zig-zag in the back, it helps while sewing with knits. I tend to increase my stitch length just a bit, just so it doesn’t pull so much and can skip over more of the knit fabric in one stitch. Looks great as the hem of those knit projects. And again, from the back. And just so you can see, the double needle stitch allows for a bit of stretch. Isn’t that double needle fantastic? I will be using my double needle more often……now that I realized that there is a solution to my lack of thread spools in the same color. Yay. Now hurry to the store and pick one up. UPDATE: And again, here’s another updated tutorial with a few more helps. Thanks for the redirect from your site Crystal! This tutorial is exactly what I needed!! I didn’t realise my old machine could do it! I love my double needle! I only thought of using a bobbin a few weeks ago when I accidently bought the wrong kind for my machine and I was trying to figure out what to do with them. They work perfect and I use it ALL the time to trim up my blankets, bibs, car seat covers and nursing covers…makes them look quite sharp when finished. I totally want a double needle now. I didn't even know they existed! I didn’t know they existed till this blog. I just got one today (hard to find around here) and am anxious to try it out. Thank you so much for your sewing tips!! I have referenced your blog many times in my sewing adventures. And I have GOT to try this double needle thing! So awesome!!! Maybe in the future you could do some sewing tips with different sewing machine feet. There are so many out there and I don't know what half of them are used for!! Thanks Ashley! You are amazing! seriously, this may have been obvious for other sewists – but this just rocked my world. Thank you for the tip! amazing… I never even heard of a double needle. Will it work with all machines, like should my machine actually say "double needle"? I just don't understand how a straight stitch will allow the bottom bobbin thread to connect to both needles on the top…..
Great post! I've seen the double needle in my bag of goodies a few times, but it's kind of intimidating looking! Thanks for the tips. I have never tried my double needle… just intimidated by it. I'll have to dig it out now and see what I can do. My sewing machine came with a double needle and had no idea what I would use it for, and was a little intimidate by it. No problem now! Your tutorials are great. You are an angel! What perfect timing! I just bought 6 different knit fabrics to make some flowy dresses for my daughter and myself for summer. I have a serger for seams, but those hems have been making me nervous! I've never learned how to use a double needle, and now I feel dumb because it is apparently so easy! Thanks so much for the tips! I have always been stumped on how to thread 2 threads through one machine – – this is like a new revelation, just thread them as if they're one – – I think I just stepped into a whole new sewing world…. Wow, that was easy, wasn't it? I just hemmed a new top for my daughter yesterday and was SO mad at the wonky lines! :-) Thanks so much for sharing your know-how! I had no idea about the double needle! Love it! Can't wait to try it out! Thanks! Oh my gosh!! I have been sewing almost my whole life and never knew there was such a thing! I have been wanting a serger or a more advanced machine for years, but with this nifty little tool, I can do so much more, more easily! Thank you! I just checked, and a double needle came in the little "pack" of tools that came with my machine. I had no idea! Other's might realize they have had one all along too! Thanks for a great tutorial…I would have never dared to try this out before! so simple (and obvious! LOL never thought of it!) but so awesome. This blog rocks! Loved the tutorial, teaching my daughter to sew over the summer and got some great ideas. I've never used a double needle, and would never have tried b/c of the thread issue…thanks!!! Wow serious this just revolutionized my sewing. I've been wanting to use mine since we moved overseas but I always buy my thread from random places and never remember to get two of the same color and welp nothing is coded here. I'm so breaking out the double needle this weekend. Thanks for sharing. oh thank you! thank you! thank you!!!!!! I just want to say that I was lucky enough to have Kristen Duke photograph my wedding and the pictures are fantastic! I'm just begining to sew and your tips are so helpful. Excellent tutorial, thank you! I am trying to get better with sewing knits. Thank you! I have used a double needle a lot. My old machine had a separate place for the second spool of thread but I have always had trouble with my new machine. I couldn't figure out where to put the extra thread. Now I feel a little silly, but mostly happy that I won't have to fight my machine next time I used a double needle. Thank you thank you!! I have been afraid of my double needle because I've never seen anyone use one but now I'm excited to use it on my knit projects! You are fabulous. Thanks for sharing your talents!! Thanks for sharing! I had never tried to backstitch with the double needle because I was in fear of breaking it! I would always just loop around and sew on top of the first few stitches. Thanks for the tip! I think I love you. You just opened up a whole new world of sewing for me!!! Thanks so much for this info! I had no idea it was so easy :) Just saying double needle intimidated me…haha! I will have to get one the next time I'm at the store and whip up some great knit stuff!! GENIUS! I'll be getting one of these babies. I'm picking up my serger soon, so… more tute's on those little jewels would be AWESOME! Best. Blog. Ever. wow, i am so excited to go to the store to buy myself a double needle! yay!! i've mimicked double seams for so long now and i did not know there was an easier way. thank you soooooooooo much!!! yay!!! It's posts like this that make me realize why I LOVE LOVE LOVE your blog. You're genious. I absolutely LOVE my double needle! One thing to keep in mind, not everybody's machines will load both spools (or bobbin & spool) like yours. Mine has a separate attachment that sticks in a hole on top of my machine for the second spool. Some machines also have to be threaded separate, like my Bernina I have to thread one thread on either side of step 2 (I think) when you bring the thread to the front there is a disc and a thread goes on either side of it. Wow thankyou, after all these years of sewing I never knew that about the double needle, I am going to blog about this and link back to your post :) thankyou so much!!! that is awesome! I will have to try it out! This was EXACTLY what I needed! I have been needing to do some hemming and this double needle sounds perfect!! Thanks for sharing!! Je n'ai jamais essayé de me servir de cette bête mais après avoir vu tes explications je sens que je vais me lancer! Haha! so THATS what that double needle is for! YES! My machine came with one and for years I have been wondering what the heck it is and when I would ever use it. Just yesterday I almost threw it away because I never used it! But shoot- if I could make my double hems STRAIGHT! wow…thanks so much!!! Wow this is awesome! I have been upset at some of my hems, and have a double needle…but it looked so intimidating–how to use it?! Bu now I know I can totally do it-thanks! I wonder if it would look ok if I just made a nice new double needle hem line over some of the things I already made…(and no way am I going to pick out the old hem–wayyy too much work!) I wonder if it would look ok if I did that over some hem lines I'm not happy with (because they aren't perfectly sewn straight). Thanks for the tips! I love your sewing tips almost as much as your awesome project tutorials. I just did something where a double needle would have been awesome if I had only known how simple it would be to use one. Do you have any tips for sewing stretchy knits/stretch stitches? I thought the same thing when I first bought my serger–that it's great except those serger thread cones are so expensive…I can't buy them in all the colors I need to serge things…until I realized I could use my normal thread on bobbins–or buy 4 spools of normal thread for at least cheaper than the serger thread! I've also had a double needle for a while but I don't have a second place to put a spool so I never used it. You have opened up my eyes!! :) Thanks. I love those DUH moments!! Great tutorial, I've learned so much from you! Thanks again!!! Yay! I always wondered about them and wasn't sure what they even looked like:0) I certainly could have googled it duh! Thanks! WOW! I didn't even know there's such thing as double needles! I can see all the future projects that will use this technique…erm…I need to go and purchase them first though LOL. Thanks a million Ashley! thank you thank you thank you!!! i bought a double needle a while ago, but i've been a little intimidated using it. that and i thought i wasn't doing it correctly because of the way it looked on the back — but i guess i was doing it right all along! hurray! I am buying a double needle now! You sold me. I sew quite often and have never used a double needle! I am buying one TODAY! Thank you for the wonderful sewing tips! I loved them all! Thanks so much for the tips! I've always thought that I needed a double bobbin in order to use the double needle LOL Guess I'm going to have to find that double needle again, hoping I didn't throw it away. Yah!! Thank you so much for help with the double needle! Thank you for sharing this! I am going to buy myself a double needle. Thank you! I have to have someone show me in pics, along with the words in order to learn something new like this. Your awesome pics and detailed explanations are so helpful! This is awesome! I didn't even know what to do with a double needle and now I want one! I will hurry the store!! I have contemplated trying these so many times, but was unsure as to how to use them. You make me realize how simple it is! Thank you!! I love my double needle – used it today in fact! Our son developed an elbow hole in his otherwise pristine Old Navy dress shirt! I shorted those sleeve for summer and used the double needle to achieve a professional looking hem! I like the double needle for making Gilligan style 'bucket hats' too – really nice top stiching. Once in a while I'll use two different colored threads on purpose to add a touch of whimsy to my dd's clothes! Sewing is so much fun! Grrrrrrrrrrrreat post!!! I see 71 others agree. I never used my double needle before. It looked intimidating to me. Well, I'm going to use it now, thanks to you! Thank you, like all your posts this is so helpful and easy to understand. I have been working on sewing the girls sundress that you did about a month ago (the one with the big bow in front. I'll post a photo(if I can figure out how) once it is finished. Sooo cute. Thank you so much!now I want to by one.but were can i find it, and were can you get a zipper foot. Thanks for the great info! I love the double needle and will have to try that sometime. Do you know if it is possible to slip-stitch a hem with a machine, or can it only be done by hand? THIS IS HUGE FOR ME! I am petite and use my sewing machine to hem pants, but now (thanks to you) I can hem those t-shirts that are too long with a double needle….hurray! How do you do that?! How do you address the exact thing I need, right when I need it?? I am so getting one of those double needles for the knit projects I'm doing soon! I'd never even heard of it before. Thank you!! I too am wondering about how the bobbin comes into play with both needles? Thanks for sharing that. I'm mostly a self-taught sewer and I've been a little intimidated by the double needle. But now I'm ready to try it thanks to your post! I learned so much from this one blog post! I will be going put and buying a double needle today! Thank you so much for the simple instructions and pictures… it really helped me get it! How wonderful. I didn’t realize that double needles were so easy to use! aaaahhh now that’s why there are two holders for the thread on my antique sewing machine!! Love!! I can NEVER get my lines to, er, line up…this is going to be a lifesaver! Thanks so much! OK, I bought my double needle today! ready to make fabulous topstitching now. Thanks for the tute! i just found your blog and I love it. Thanks for teaching me how to use a double needle! I’m in complete awww! I haven’t been sewing long, so thhis is soooo good to be introduced to. I double stitch and its so hard to keep the lines evenly spaced. This would work wonders for me. Going to go buy one!! Just used this technique this afternoon. It took a few tries to get it right, my stitch length had to be about a 3 but it worked out and now my daughter’s long sleeve shirt is a short sleeve shirt (using some of that tutorial as well) with a nice even double hem and I love it! Thanks for all the hard work you put into this blog! It helps a beginner out for sure! I have question on the mechanics of it all. How does the bobbin thread (bottom thread) know what to do? How is it caught in the double stiches? It looks wonderful and I am kinda new to sewing. thanks! That double needle is amazing, I never knew they existed but now I think I need one!! Thanks for sharing a great tip!! I just bought a serger and am wondering if/how you can do a double straight stitch with one!? It seems like you could but I’m not sure if you’d just skip a looper or what? To make a double line with a Serger/Overlock like on the hem of a purchased factory t-shirt you have to have Cover Hem ability on the serger. Your top of the line Sergers will have the Cover Hem stitch. If your serger can use 5 threads you may have the Cover Hem ability. You will have to check your Manual. Cover Hem is also used to create a decorative stitch on light formal fabric like netting, tulle. Think of sheer fabrics with cross hatching. The blade is disengaged while doing the cover hem. A Twin Needle on your sewing machine will give you the Cover Hem look on top. It does not give the triangle overlock look on the back. I think this post is why I’ve had such a hard time finding a double needle for months! :) I also think I might have to print off your picture of the zig zag stitches because I can never remember if it’s the length or width I want to change. Thank you! OMG. You have revolutionized my simple sewing life. I’ve never been able to use knits properly for anything and never dreamed of being able to make clothes for my little munchkin. Thankyouthankyouthankyouthankyou!!! Thank you so much for sharing this. Since I read your blind hem stitch tutorial I’ve wondered what those other stitches my humble little machine could do were truly for. I previously thought they were probably just ‘pretty’ but now I use blind stitch on everything LOL. Especially if I am whacking up something my husband requests out of hours with scrap fabric and my thread doesn’t match haha. This is SO awesome!! Thank you so much! I have always wanted to know how to do this and I didn’t even know I could with my machine! This is fantastic! Can’t wait to try it! I have issues with my double needle, it came with my machine so I know it’s the right size. It always skips stitches and gets all tangled no matter what I do to try and get it to work right. It’s worked for me once and it only worked for a minute and then went back to its tangling and skipping. I’m at a loss on what to do to get it to work. Oh my gosh, thank you for this!! I could never figure it out where to put the second spool of thread, so I never bothered to even try. This is incredibly helpful, and now I want to try it out! I’m also in the bought a double needle it sits in the drawer club. After your tute,I’m going to find an excuse to use it!